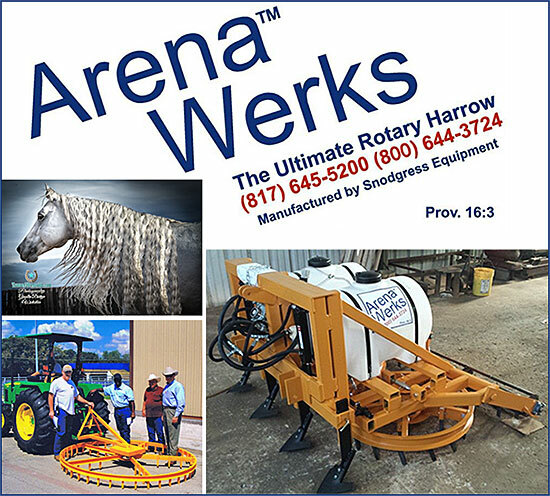 The Original Arena Werks™ Drags, are a collection of rotary harrows designed to guarantee your horse sure footing in your arena. The Arena Werks Drags came to owner Randy over 30 years ago. He purchased and customized a drag for his arena and the next thing he knew, all of his friends wanted one too! Randy used to train horses so he knew how important good footing was in an arena for horses. Five different models and four different sizes were created to accommodate all arena types as well as orchards, baseball diamonds and landscaping. Since his companies origination, Arena Werks Drags are now industry standard endorsed by the likes of Ty Murray and Terry Bradshaw! We WERK So You Don't Have To! The circular motion of the arena drag takes the high spots of dirt and spins them around and deposits them in the low spots. It will grab the dirt that gets thrown up on the rail around the arena fence, therefore, leaving a smooth, level finish on the arena. You won't find another arena drag that does more! We manufacture different arena drag models, and different sizes for everyone’s individual needs. What About Other Arena Drags? Aren’t They All The Same? No! That is why our clients love Arena Werks! With the Arena Werks arena drag you are able to Water, Rip, Level, and Smooth all in one swipe. And with no corners on the drag, you are able to get close to the fence and it won’t hook the fence post. The basic straight drag harrow won’t fill in your low spots; it will just run over the high spots and not level the ground under the top level of dirt. It can’t get the dirt off of the rail and move it back to the middle. It leaves ruts in the arena footing. What If I Have Rubber Footing, or A Specialized Footing? Arena Werks™ can handle it all and we do it better than anyone else! Our harrows also work well with rubber footing and different types of footing used today by Ropers, Reiners, Western Pleasure, Cutting, and English riders. Our harrows are also used in orchards, baseball diamonds, and even landscaping. What If I Am A Barrel Racer? Do You Have A Model To Help Me? You bet! Our Lonestar™ model was made specifically for Barrel Racers! The drag has 8 narrow box blade rippers for when the ground gets packed, it has 4- 2′ wide circles that are close behind the tractor tires to prevent resistance when make sharp turns around the barrels, and the drag bar on the back to leave a finely tuned top finish that is not too slick to help prevent your horse from slipping. What If I Have Packed Dirt Clods? How Do I Get Rid Of Them? We're so glad you asked... we are famous for getting rid of them. Just see our video below! The Original Arena Werks ™ comes in many different sizes, from 5' to 9', is available with welded or replaceable teeth, and is designed to be pulled behind a tractor. The circular motion takes the high spots of dirt and deposits them to the low spots in your arena. This motion will allow for a smooth level finish for your entire arena. Don't have a tractor to pull your arena conditioner? No problem. The Arena Werks Buggy™ is for you! It has a three-point hookup just like a tractor. It can be pulled behind a pickup truck, gator, mule, or 4-wheeler. Harrow sold separately. The Arena Werks II™ comes in three sizes: 6', 7' and 8'. The AWII requires a tractor and hydraulic remotes. In addition to the teeth on the harrow itself, the AWII has a row of blades in front, which help break up hard-packed soil. The Arena Werks H20 Pro is the newest model and comes in three sizes: 6', 7' and 8'. The H20 requires a tractor and hydraulic remotes. All of these models come with 1" teeth. What Are Horse Owners Saying About Arena Werks Drags? The endorsement list for Arena Werks is filled with celebrities in the equine industry! One of those celebrities, Matt Tyler, has said the following about Arena Werks Drags: "Arena Werks provides the right footing for my horses to perform at the level I ask of them. One pass over my arena and it is ready!" Don't Your Horses and Riders Deserve The Best? Order Today! Making sure that your arena is well maintained, watered and groomed will only increase your enjoyment of riding for both you and your horses! Few things make riding nicer than a nice, well groomed, sparkling arena. For those of you with horse farms, boarding stables or training stables, a well maintained arena is an absolute MUST -- or you will loose clients. Call Arena Werks™ today- and let us help you on your way to the best footing for your horses!